← “Charity Begins At Home” – But Is the Rangers Charity Foundation in Breach of the Law? On of the problems of a detailed post-blogpost argument in the comments is that some of the issues can get lost amongst the various threads. For that reason, I hope my reader does not mind me putting a fresh sheet into the typewriter and continuing the discussion on a blank page? I am very grateful to all of the commenters, especially iain, Duplesis, The Black Knight, Kevinjohn and cavansam, amongst others, who kept the discussion going whilst I was otherwise engaged today. Anyone who feels that we are flogging a dead horse is free to pass on by – I am sure the administrators will say something soon for comment! Or indeed I might get to finish my post re the book about Mr Al-Megrahi. However, for now, this is a follow up to yesterday’s post regarding the proposed match between Rangers Legends and AC Milan Glorie on 30th March. The excellent Rangers Charity Foundation (RCF) organised a match at Ibrox to raise money for RCF and the AC Milan Foundation. It has now been stated by RCF that, in light of Rangers’ present predicament, the charity is going to waive the majority of its share of the proceeds for the game, allowing these to be retained by Rangers. I pondered whether or not such a decision (a) was properly made by the Trustees who are legally responsible for the actions of the Charity and (b) whether such a decision by RCF could fall foul of charity law, as it appeared to be contrary to the object and purposes of RCF. My purpose in doing so was not, as some suggested, because I have an axe to grind, or because I am a bigot, or “Rangers hater”, nor because I wish to “twist the knife”. It struck me, as I mentioned in my comment on the piece that, with all the upheaval at Ibrox it was possible that a well intentioned decision had been taken without anyone considering whether in fact it was one the charity could make. Nor was this a case of my “mask slipping” and my “bitterness oozing out” as was suggested. For the avoidance of doubt I was not calling for a write in campaign to the Office of the Scottish Charity Regulator. Indeed, as the match has not yet taken place, and is a month away, there is plenty of time for RCF to check the position, if it feels it needs to, and satisfy itself that its actions are proper. If this results in extra money for the charitable causes supported by RCF, and avoids any additional legal difficulties for the Chairman of the Trustees, Craig Whyte, then who could have a problem with that? The defence advanced vigorously by, amongst others, iain and Duplesis was as stated below (and if I misrepresent their views I am sure they will correct me). If the match was organised by Rangers, and Rangers was giving a donation from the proceeds to the charity, then there was not a problem, as it was legitimate for a charity to decline a donation, or part thereof. This would allow Rangers to keep a larger share of the proceeds, and to do so legally. Rangers is entirely justified in keeping as much of the gate as it wants, whilst still doing good by giving some money to charity. Because of the intervention of administration, the administrators were entitled to change the basis on which the match was to take place. The administrators were also entitled to charge the charity extra for use of the ground and facilities to maximise income. No one had yet bought a ticket for the game, and therefore no one could be misled as to the nature of what they were paying for. 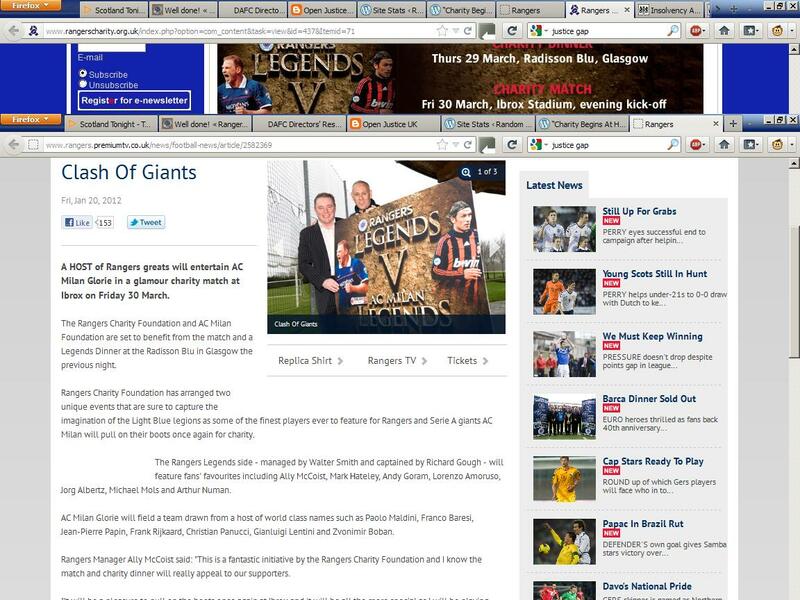 The match remained a “charity match” but now more of the proceeds were going to Rangers, rather than RCF. In addition, if the support of RCF towards Rangers helped keep the Club afloat, then this would enable RCF to continue with Rangers’ support, thus securing the long term future of the charity. 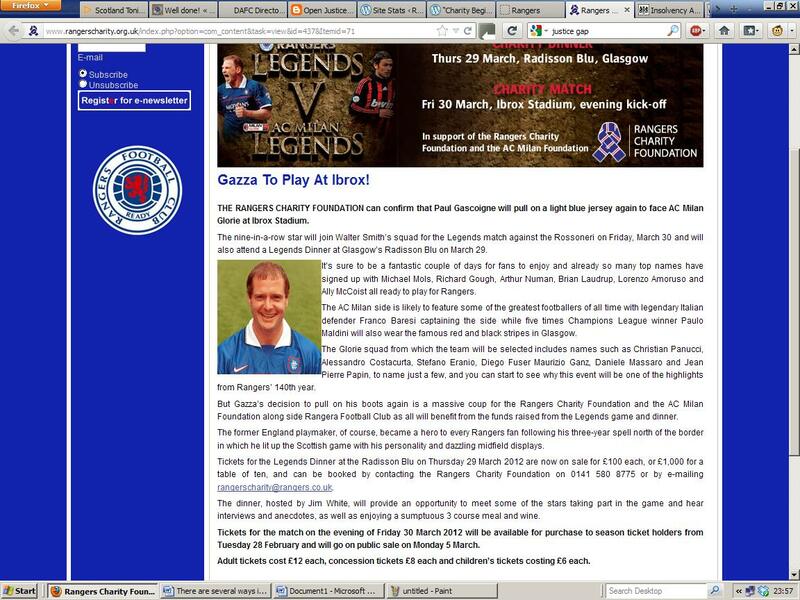 The Rangers website has on it a piece dated 20th January 2012. This is titled “Clash of Giants”. “A HOST of Rangers greats will entertain AC Milan Glorie in a glamour charity match at Ibrox on Friday 30 March. The Rangers Charity Foundation and AC Milan Foundation are set to benefit from the match and a Legends Dinner at the Radisson Blu in Glasgow the previous night. Therefore, RCF, at least according to Rangers, has organised the match. EDIT – as referred to in the comments, RAngers FC has NOW taken over the running of the game. If RCF Organised it, Maybe Rangers or the Administrators Have Taken It Over? The latest mention of the game on the Rangers website states that Rangers Football Club has confirmed that the game will go ahead. However I am unaware of any suggestion that the match had been cancelled, nor is it stated anywhere, as far as I have been able to see, that the administrators have decided to take over the organisation of the match. Therefore, in the absence of evidence to the contrary, it would appear that the match is still organised by RCF. Maybe The Administrators Have Increased The Costs to the Charity for Using Ibrox? “Tickets are priced £12 for adults, £8 for concessions and £6 for children”. There is nothing wrong with that happening. In fact it would be wrong for the administrators to run a game at a loss for Rangers, as this would be a breach of duty towards its creditors. It would be legitimate to run an event which did not increase Rangers debt, even if it did not bring it down. A cost-neutral match would, I think, be entirely appropriate. The administrators could not hike charges to an unrealistic level to bring more of the proceeds into their coffers, but that is not what is happening. Ticket prices have gone up, and RCF is “foregoing” the larger part of its share. It is interesting that the RCF page which went up in January at the same time as the “Clash of Giants” piece referred to has been amended since last night when I wrote about it. NB click on the image to enlarge. In addition that web page has been amended to reflect the new prices, rather than the original charges. However the “Clash of Giants” still lists the old prices. So Where is RCF Going Wrong? “Your quote, that this is a “charitable act by the RCF” is both accurate and the issue. It is illegal for a charity that has a tax-relief status to give directly or indirectly to a limited company, which Rangers FC (in administration) is. 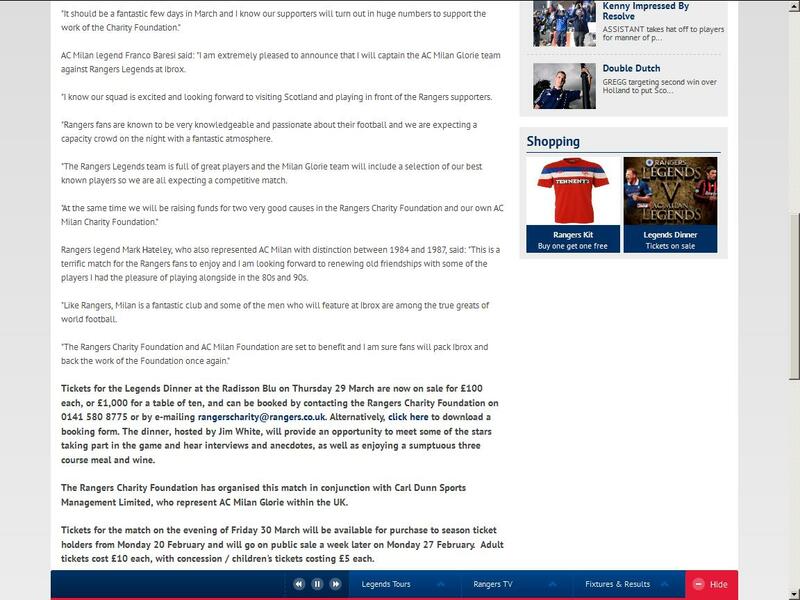 And please, before anyone suggests that Rangers FC (in administration) are running the event in question, and donating the money to the RCF (though donating a smaller percentage than previously planned) – they cannot do that. You see, Rangers FC (in administration) are prohibited from releasing funds to 3rd party companies that are not “secured creditors”, or “essential to the continued existence of the limited company” (see: Administration Act 1992 for reference). 1. If Rangers FC (in administration) run the event and donate raised money to the RCF, it is in breach of the administration laws. Kevinjohn was rubbished for his reference to the “Administration Act 1992” by iain and Duplesis, who saw this as blowing Kevinjohn’s argument out of the water. As they pointed out, there is no “Administration Act 1992”. This seemed to detract from his reference to Rangers (in administration) being precluded from releasing funds to third parties where the third party was neither a secured creditor nor “essential to the continued existence of the limited company”. I think though that Kevinjohn can be forgiven his lapse. What he was in fact referring to was the Enterprise Act 2002, which amended the Insolvency Act 1986 by inserting Schedule B1, which deals with administration. That is what Kevinjohn was saying, despite the wrong statutory reference. There seem to be two, as outlined above and discussed below. If RCF is organising this game, then the proceeds belong to it, subject to paying the costs of the facilities. It would be a breach of charity law for it to decide, effectively, to make a donation to a commercial enterprise, and as Mr Whyte is Chairman of both (though without power in Rangers just now) this would be a huge conflict of interest, against which Trustees if charities are warned regularly. Neither can the administrators say that in fact the costs of staging the game are far higher than originally estimated and therefore RCF has to pay more to Rangers to cover costs. RCF is quite clear that it is forgoing the majority of the proceeds due to it. In this case, as the company is in administration, it cannot make charitable donations in the circumstances outlined as this would be contrary to paragraph 65 (3). EDIT – it is subject to debate whether paragraph 66 would permit this as being “in the interests of the administration”. I still have serious doubts, but I am sure in the remaining time Rangers and RCF will ensure all is done properly. Such a donation, whilst a “good thing” as far as the charity goes, would be prejudicial to the creditors, and as such the administrators could not do it – their first duty is to the generality of the creditors. What Should RCF and Rangers Do? Before anyone thinks I am big-headed enough to imagine that Rangers pay any attention to what I write (and I can’t imagine they do) I think it only fair to those who were good enough to comment that I suggest how the matter should be resolved. I think all the contributors agree that it would be better that the game go ahead than not, for the sake of the charities. Accordingly RCF should receive the proportion of the proceeds already pledged to it. Rangers ought not to be left a penny out of pocket for staging the game, and indeed could ask to be paid a commercial rate for the match being held there. However, it might now be seen that any effort to announce that was the position would be scuppered by the statements referred to yesterday and above. I suspect that, if matters proceed as suggested by RCF and Rangers now, that the OSCR or alternatively the Insolvency Service would be all over RCF and/or Rangers and its administrators respectively. Let’s see what happens, and also let’s see if, for the sake of avoiding confusion, the “Clash of Giants” page gets a makeover to record the changed plans. This threatens to go all Jarndyce and Jarndyce. Anyone can make a mistake, and so I agree Kevinjohn can be forgiven for citing a non-existant statute. I see what you say about paragraph 65(3), but the exclusion isn’t as absolute as Kevinjohn suggested – perhaps the Administrators have the Court’s permission for this. That seems to me to give a somewhat wider discretion. It takes us back to the definition of purpose of administration in paragraph 3(1). It therefore would seem to me to allow payments which the Administrator feels may assist in rescuing the company as a going concern, or making the position of the company’s creditors as a whole better than would be the case if the company were liquidated. Perhaps the Administrators think that the money RFC would be in line to receive from this game might assist in rescuing the company or in raising funds for the creditors. Perhaps they could argue the game wouldn’t go ahead without a payment to RCF (or indeed Milan Glorie), and so the payment assists the purpose of administration. I continue to be intrigued as to the relationship between para 65 – which forms the basis of kevinjohn’s (and now Paul’s) argument, and para 66 which I mention above. In a nutshell, their argument is that RFC can’t be running the game and passing on a share of the proceeds to RCF as that would be unlawful under para 65. I’ve suggested (and maintain) that in fact this is the most likely set up for the game now – I believe the organisation of the game changed after the Administrators were appointed. I’m wondering if the difference in approach evident in those 2 paragraphs only makes sense if we understand the difference between a “distribution” (para 65) and a “payment” (para 66.) I’m guessing a “distribution” is a payment to a creditor who was a creditor at the point of the administration, whereas a “payment” may be wider. Given this, I think the argument that RFC can’t pay RCF due to the provisions of the Insolvency Act 1986 as amended is flawed. I would also like to know who took the decision to forfeit some of the proceeds of the match. As CW is both one of the trustees of the foundation and also the majority share holder of the football club, there is a clear conflict of interests here. A second point is that charities have governing documents which sets out the rules by which the have to abide, their constitution. Usually these documents contain rules on the quorum (the % of the trustees, board or executive committee that need to be present in order to make such a decision) As the four comprise of Craig Whyte (should have sat of the decision making process due to above conflict of interest) John Greig and Martin Bain (who have both left the football club in not the most amicable of circumstances) and finally Jacqueline Gourlay. It would be most unusual and improper to have a quorum of one. Almost as unusual as it would be a trustee voting to confer financial benefit on one of his companies. I have dipped in and out of this discussion over the last 24hrs (time permitting). I don’t feel it should be viewed as an “Anti Rangers” discussion. I see it more of people discussing and preventing Rangers falling foul to more negative headlines. 1.The PLUS Stock Exchange find Rangers 50k for non disclosure of Craig Whyte’s previous disqualification as a director. The process when applying to OSCR to become a trustee is similar to Stock Exchange & Financial Services Registration. ..I “feel” more is set out about this (trustees) under Sections 69 and 70 the Charities and Trustee Investment (Scotland) Act 2005 set out the circumstances that would disqualify an individual. If required, has Mr Whyte disclosed his previous disqualification as a director. If not, does this have any repercussions? 2.I quote from the RFC website “We are proud of the impact the Foundation and its supporters have made over the last nine years and the list of projects we have helped to fund below shows just how much your support has achieved. Their work is commendable, for that reason I would hope “due diligence” has been carried out by RFC regarding the proposed match and distribution of donations. 4. I regularly browse the Rangers Media forum to see how the fans are feeling/reacting to the whole unfortunate saga. On this topic of Dunfermline, to their credit the majority of the posters have real empathy for Dunfermline and have even suggested donating themselves to make up the deficit. However, as on all forums some are less empathetic. http://forum.rangersmedia.co.uk/index.php?showtopic=212546 (some people may be offended by the language). For some this makes the fund raising issue an even more bitter pill to swallow. Forgive spelling errors…typed in haste! “When you discover that you are riding a dead horse, best strategy is to dismount”. 1. Buying a stronger whip. 3. Appointing a committee to study the horse. 4. Arranging to visit other countries to see how other cultures ride dead horses. 5. Lowering the standards so that dead horses can be included. 6. Reclassifying the dead horse as living-impaired. 7. Hiring outside contractors to ride the dead horse. 8. Harnessing several dead horses together to increase speed. 9. Providing additional funding and/or training to increase the dead horse’s performance. 10. Doing a productivity study to see if lighter riders would improve the dead horse’s performance. 11. Declaring that as the dead horse does not have to be fed, it is less costly, carries lower overhead and therefore contributes substantially more to the bottom line of the economy than do some other horses. 12. Rewriting the expected performance requirements for all horses. 13. Promoting the dead horse to a supervisory position. The problem with clearly intelligent guys like yourself is that you assume everyone else is stupid. I wonder if Celtic supporters will ever have a look at their own behaviour throughout this whole debacle? As I said the mask always slips…. I’m sure the Celtic support will indeed have a look at their own behaviour. Attending matches. Signing songs. Discussing the issues at hand. Yep, it’s all there. Meanwhile, over at cloud cuckoo land: denying culpability, looking for get-out of jail cards, passing the buck and once more being up to one’s knees is the order of the day. Yep, a bit of introspection from Celtic fans is exactly what’s required here. Now Now, put the handbag down – for every ‘up to our knees’ chant there is one in support of terrorism. Not that I personally care about such matters – it’s just always nice not to take issue over a matter where one is not ‘whiter than white’, or should that perhaps be, ” Whyter than Whyte”. What about Milan’s share of any money raised? Are they protected by law or could rangers eventually claim they are legally unable to cough up? now that this game is Glamour friendly status… does it still have tax free charitable status? Bit late to comment but I have only just seen this. I think you are due a special prize. You have managed to add to Rangers’s problems by bringing Berlusconi into this! Sadly, I do not have a great deal of time to reply here, and I wish I did, because it is a very interesting subject. I have not read the rest of the comments so i have no idea if anyone has touched on the subject; if they have – then forgive me. Under the Enterprise Act, an administrator CAN make a 1 off payment to a company or organisation that is not a current or secured creditor if it is for the best interest of the clubs survival. For instance, Rangers have upcoming matches – payment to the police would be ‘in the best interests”’ as it means a match may go ahead and generate revenue for the club, albeit a small amount due to season ticket holders etc. In this form, a match held by RFC in the NAME of a charity (with a small donation thereafter) WOULD be allowed as a power of the administrator as the match would in turn generate income for the ongoing survival of the club and settlement of any debts/running costs. The match would be viewed as beneficial to the continuation of the club as an ongoing concern. 66 The administrator of a company may make a payment otherwise than in accordance with paragraph 65 or paragraph 13 of Schedule 1 if he thinks it likely to assist achievement of the purpose of administration. As with any rule in law, there are always exceptions. As of yet, I believe that no tickets are on sale for the event (correct me if I am wrong). It is possible that the event is pulled by the administrators, changed from a ‘charity’ match to an ‘RFC’ Friendly match with charitable donation, and put back on the shelf as such before the tickets go on sale. Anyway that is my tuppence worth for today, unfortunately this type of law is not my forte. Have eventually managed some ethical clearance for a body of work so unfortunately I do not even have time to research further to aid the debate. Good work though. Ignore the haters; I do. Second, as a matter of authority. In Re Mount Banking plc (25 January 1993) Ferris J authorised administrators to make payments on account (in exercise of the power conferred by para 13 of Sch 1) to pre-administration creditors. He did so in order to preserve of the goodwill of the company’s business pending the attempt to achieve the survival of the company and its undertaking. The effect of such payment was to enlarge the entitlement of the persons paid beyond that to which they were strictly entitled under UK insolvency law. It was permitted in order to achieve the purpose of the administration. In Re WBSL Realisations 1992 Ltd  2 BCLC 576,  BCC 1118 there was the possibility that a £1.5 million surplus on a pension scheme would become available to unsecured creditors, providing that a compulsory liquidation was avoided. But anything other than a compulsory liquidation would prejudice preferential creditors. The conventional means of achieving a distribution satisfactory to the preferential creditors whilst avoiding a compulsory liquidation were not available. Knox J permitted the administrators (in exercise of the power conferred by para 13 of Sch 1) to make the payments to the preferential creditors to which they would have been entitled if there had been a compulsory liquidation, even though there was to be no such compulsory liquidation (in order to secure the possibility of recovering £1.5 million for the benefit of the creditors as a whole). The effect of the payment was to enlarge the entitlement of the persons paid beyond that to which they were strictly entitled under UK insolvency law. These three cases stand for the proposition that even under para 13 of Sch 1 (which is narrower than the power conferred by para 66 of Sch B1) administrators can make a payment for the overall benefit of an administration even though the persons paid thereby received a benefit greater than their strict entitlement under UK insolvency law. The cases are directly in point on the scope of the power. It is important to observe that if the power is large enough to cover the intended act of the joint administrators then they do not have to apply to the court for permission to exercise that power (though they may seek directions from the court if they so desire). Not 100% accurate to the case/situation at hand, but more general to the powers. Glad to see the confusion has been clarified on the website, and the risks we all discussed seem, perhaps, to have been avoided. Why bother about small fry ?? The main issue is that Ranger FC have not paid NI, PAYE and VAT, we can argue over who is responsible and when the liabilities should have been allocated, but as an Institiution of Scotland, RFC should have set an example to all, instead, for reasons only known to SDM and CW, they have chosen to break the British Law. May I also point out that the Financial Services Mafia has failed over the years to highlight this issue, if the UK is to continue to be a Financial center, then Basic Company Accounting and Auditing needs to be wothwhile and meaningful, if it was, then the RFC, HBOS, RBS and other such collapses would not occur. Other Scottish Football Clubs and I am sure that many small Businesses are feeling the effects of RFC not paying, Ordinary people will lose their jobs and find it extremely difficult to find alternative employment, at the cost of every Tax Payer in the UK, no matter what Team they support, carrying the Cost of RFC. My point, though, is this, have you ever heard of a Scottish First Minister and a UK Prime Minister, giving “support” to a Tax Avoiding Company ( Allegedly ) that in Fact should be making a contribution to their Salary and to that of other Public Sector Employees who are in great danger of losing their Jobs. Please All, stop debating the Tim versus Hun issues and the small print, please look at the bigger picture, if WE all behaved like Rangers, the whole of the UK would collapse !!!! I have also said that for the longest time this country has failed to keep up to date with finance and now that money is in rather short supply: these issues are coming tothe fore. There are many, many tax avoidance schemes in place out there: many are in place today. Take the example of a ‘self employed’ journalist that sets up a company in their name as a way of paying corporation tax as opposed to income tax of 50% on their earnings over the threshold. It’s not well documented, but it is a rather popular trait among many out there and not only journos. I note that you haven’t responded to the replies to this Blog, although you clearly have been back to the site, since you’ve produced further articles. I note that despite it being pointed out to you that your reference to paragraph 65 of the Schedule to the Insolvency Act 1986 might not be telling the whole story due to the rather wide exception apparently created by paragraph 66, nor have you added any addendum dealing with this point. You suggested it might be interesting to watch for changes in the RCF website to see how they addressed the muddle you perceived them to be in. Well, they have, and it seems to now confirm that the position is exactly as Iain and myself had been saying all along – as has also been pointed out. without acknowledging that the provisions of that paragraph are greatly qualified by the very next one. Or is the problem that that wouldn’t suit the case you’ve been trying to make? To adopt what appears to be “the House Style,” I want to be clear that I am not for a moment suggesting that you are deliberately misleading visitors to your blog, but it would be a pity if one were left with that impression. Thank you for your observations on the House Style – touche! I still feel that, if subject to challenge, it would take some justifying by the administrators. I have added a comment to the text of the post, whcih I trust meets with your approval. well done Paul for bringing this, and other issues, to their (Rangers FC Plc IN ADMINISTRATION) attention! This could quite easily have gotten very messy indeed! As a fan of Scottish Football living in Australia I have been avidly following the situation concerning Rangers and their financial problems in the comments sections of all Scottish daily newspapers . Unfortunately most of the arguments are based on accusations of child molestation, sectarian singing and various other irrelevant issues going back as far as the turn of the century. Whilst reading the comments section in one Daily Record article there was a link to this forum. Since then I have read little else. The legal aspects surrounding Rangers administration are many and complex. I would like to thank Paul and several other contributors from both sides for their attempts to enlighten the rest of us who do not understand these complexities. To Paul and the other sensible, knowledgeable posters, please keep the info coming. Richboy …………If you can access this lnk, it is the last week’s football phone in. Thanks ifa very much appreciated. Can’t believe I didn’t think of radio links, doh! Hi Paul – I have a question related to income received by Rangers (In Administration) from this match & also from the new “Fans Fighting Fund” – what is the taxation situation with respect to these?